Stepping into the room, I am enveloped in darkness. As my eyes strain to adjust to this new environment, I notice the floor seems to be moving. I reach for the light switch and tap it on. To my surprise and horror, I discover rattlesnakes slithering along the floor, undulating, pushing off one another like a moving blanket. They seem uninhibited by the announcement of my presence. Terrified, I search the room for some escape. Finding none, I stand there paralyzed, rigid in form, waiting for help. And then a snake begins to spiral up my leg. Art by Laura Smith, used with permission. Snake Rising. Oil on canvas, 18” by 24”. June 2011. Our dreams speak to the story of who we are, where we have traveled, how we engage the world, and what keeps us from embodying our true selves. They assist us in facing our traumas and offer a remedy for the pain. Dreams show us our greatest gifts and our deepest fears. They are the primordial juice of our universal knowing unencumbered by the ego and therefore rich in personal and universal mythology. And through these stories, we are offered guidance that, if taken, will begin to shift our consciousness and open us to the healing and wholeness for which we yearn. The more intimately we observe the dream, we discover that it also speaks to the collective experience that is the Earth’s dream, dreaming us awake to Her. There is a remarkable parallel between the ecological destruction that has ravaged the earth and the human capacity for suffering spiritually, physically, and emotionally. As we continue to be a part of, and/or witness to, the persistent devastation of the land, we feel the perseverance of our own alienation, disenfranchisement, and exile from soul self and spirit. This exile provokes the illusion of separation not only from our inner soul self but also from the environment and its cycles. This illusion of a split expresses itself internally through physical illness, depression, constant anxiety, unfulfilled desires, and spiritual numbness, to name a few. Outwardly it can manifest through isolation, reckless behaviors, over-consumerism, a fear of the natural world, deep denial of the ecological crisis, or an overwhelming grief for our role in this crisis. Many people who yearn to fill the emptiness caused by this separation either search for guidance from healing modalities that address the personal self or the ecological but not always both consciously. Theologian Thomas Berry reminds us that, “A degraded habitat will produce a degraded human,” and in turn, a human who degrades the environment will become degraded. We cannot heal our personal story unless we also are healing our ecological story. If we believe this is so, then it is imperative that we explore healing pathways that guide us to the wisdom of our story weaved within the voice of the Earth. Dreams offer a path to healing the personal and ecological. Their light illuminates our psyche, a collective living fossil of our primitive soul self as Swiss psychiatrist, Carl Jung, suggests. In this way, the dream offers wisdom for awakening to our true selves while gazing into the intimacy of our forgotten relationship to the cosmos. 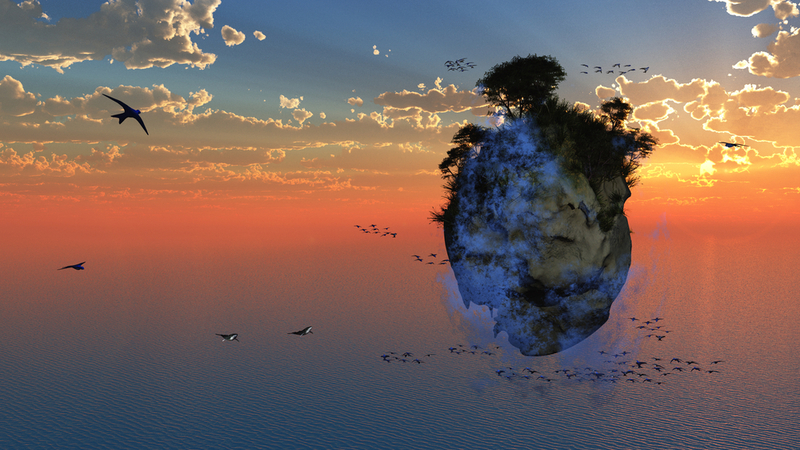 Could it be possible to engage our dreams as a path to remembering our place within the Earth community? Do our dreams provide a glimpse of the two million-year-old self that is our primordial connection to all beings? Could these stories offered within the dream show us the places where we are separate and/or connected not only with self but also with the cycles of the landscape around us? The answer is yes if we are willing to journey into the dream story as our encounter with the soul of the Earth. To work the dream as the story of self and the collective experience in relationship with Earth, I use an integrative archetypal style. This modality of dreamwork focuses on the associations, feelings, relationships, and memories that are discovered as the dream story is explored. Each dream story belongs to the dreamer and is worked without generalized interpretations or a dream dictionary. The journey within the dream is one of curiosity and exploration, a path of inquiry that brings to the surface an awareness of how the dreamer relates and engages the world as a result of their life experiences. Along the way, we tap into the felt experiences of the characters, actions, terrestrial expressions, and their relationships to the dreamer that have yearned to be known. As we step through the dream portal into the story, the impact of personal and environmental trauma is unveiled as are incredible relationships, gifts, and longings. To support and challenge the dreamer in this process archetypal characters are revealed and mythological themes are explored that assist in unlocking the dream’s wisdom. Ultimately, this approach brings to the surface memories that disclose the source of our pain and joy, allowing for a more tender examination of who we are and yearn to be in relationship to self and others. Finally, it is the wisdom garnered from the dream that evokes in the dreamer a new story of awareness to self and other. In my dream story, I explore the associations to all its elements noticing that my relationship to snake is the vital thread to understanding the dream’s wisdom. 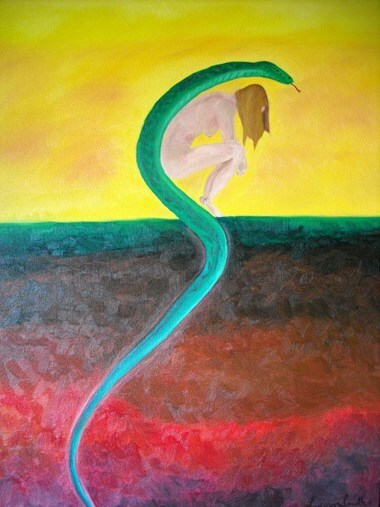 The snake comes as a reflection of my waking journey, a mirror to my perception of self and the Earth, a mythological and archetypal creature engaging me in an alchemical experience. Snake, a living, breathing reptile, offers the experience of relationship with me on a very personal level and is a reflection of me struggling to gain access to my potency. I come as snake opening to the consciousness and vitality of this incredible creature. Snake may come as healer, initiator, lover, guide, or its’ true self inviting all of us to know ourselves in the greater cycle of the Earth just as tree, tornado, ocean, mouse, rose, or human does in our dreams. In working the dream, I relive the moment of standing in the darkness of the room as the floor moves evoking the fear that causes me to turn on the light. I experience the fear again but this time letting it carry me into a deeper awareness of what is underneath the fear. The feeling of powerlessness and grief arise which was born from a place of enduring trauma, through subjugation and the loss of freedom in my life, and I stay with this feeling for a moment absorbing in this wisdom. Then I turn on the light and feel the terror of being with the snakes, their bite, the pain, and my possible death. I remember my waking world fear of snakes where I feel similar anxiety and fear in geographic locations, which support the habitat of rattlesnakes. Yet on the mythological and spiritual level, snake represents potency, transformation, and sensuality for me. I continue opening to the dream story by feeling into my paralyzed body and the desire to be rescued, all connected to my wounds and a yearning for the love. As I re-step through these dream story moments of feeling, layers begin to peel away exposing the truth of my pain, distrust and fear of relationship and love. This place of knowing offers questions that encourage me to go even deeper. When in my waking life do I feel powerless or subjugated? How do I paralyze myself and then search for rescue? What keeps me from expressing my potency? What needs to happen for me to move through and heal my wounds? Who is snake to me? There is a place for a healthy fear of rattlesnake yet my fear can be overwhelming. What is this about? The answers ask me to reenter the dream story where I embody the snake’s reptilian skin feeling the dance of my movement along the floor and up my leg. I do not judge. I join within, shedding my skin to enter snake’s skin. I speak the language of the snake so I can hear its wisdom in me. The intention of this form of shape shifting assists in cultivating an awareness and trust between the snake and myself which fosters the transformational energy that can flow between us. All of this provides the substance for creating a daily practice that incorporates feeling into a unique relationship with snake. My practice mantra becomes, “Feel the fear and experience snake spiraling up my leg. Feel the dance of sensuality as it moves around my leg, recognizing that snake is offering to be in relationship with me. Notice when my fear causes me to turn away from my potency. Notice when I want to be rescued.” I experience this practice as a gesture of movement, feelings, and visualization on a daily basis. This practice triggers an alchemical reaction on a conscious and unconscious level. My dreams evolve, and, in the next one a snake bites me. My practice changes to feel the snakebite and its venom flowing through me. I am dying to self and will be transformed. Alchemically I continue to change, opening to a profound level of awareness regarding the fear that fuels my separation from snake and self. I discover that my fear of snake is my fear of experiencing my wild primal self. As I continue to work the wisdom of my dreams along with my earth based practices an energetic shift begins to occur internally. I feel less depressed, isolated and unloved which gives space for my passion to teach Earth spirituality and dreamwork to arise. I open to a call to journey to the desert as a deeper kinship with snake comes to life. I open to trusting the love more deeply in my life. No matter where we are in life’s journey, the work of our dreams can activate the spiral motion between awakening to our soul and the soul of the Earth. If we are receptive to the guidance of the dream, risking the pain of our wounds and/or the joy of desire, we can remember and awaken to deeper healing on a personal, spiritual, and ecological level. We can heal the split in our relationship with nature and remember our place in the more than human world. If we stand in the associations, feelings and memories that the dream story offers, we can be initiated into a profound relationship with Earth and ones’ primal, wild self. We will once again feel Her love and take a path to reclaiming our role in acting on Her behalf. I stand in the presence of the snakes, one spiraling up my leg. I am terrified I will be bitten, I will feel pain, I will die, and I will be transformed. I will discover who I really am, I will embrace snake as snake embraces me, and I will become snake medicine. Berry, T. (1988). The dreaming of the earth. New York, NY: Random House. Jung, C. & Sabini, M. (2002). The earth has a soul: C.G. Jung on nature, technology & modern life. Berkeley, CA: North Atlantic Books. Mary Kay Kasper works with the intellectually disabled, is an ecotherapist, dream practitioner, rites of passage & wilderness guide, Druid Priest, ceremonial leader, and writer. She has worked with her dreams for over 25 years, facilitated shamanic dream groups and instructed college courses on Ecopsychology. Her passion lies in facilitating deep inquiry into the mysteries of the dream’s guidance as a gateway to our soul-rooted relationship to the earth.